In a modern household like mine, where the Lady of the House maintains a hectic social schedule that would daunt most people, Lunch must, of necessity, often be relegated to the back burner, as it were. And I’m afraid that’s where Richard finds his Lunch at The Bucket Residence upon the odd occasion. Not that I don’t take my wifely duties inside the home as seriously as I take my charitable works outside the home. Far from it! On those days when I am not called away to take charge of the White Elephant at our Church’s “Bring and Buy” or some similarly important social event, I can always be found – when Lunch time approaches – in my well-equipped kitchen, apron on, preparing a simple lunch for the family which in my case, normally consists of myself and Richard. Our son Sheridan would visit us more often but he’s too altruistic. What a thoughtful boy, Sheridan! So like his Mummy. He and his very suitable friend Tarquin are frequently off saving Rumania. Family lunches are not occasions where you will want to waste your time and talents on haute cuisine. Save yourself for your Candlelight Suppers (see Chapter Six: The Candlelight Supper). Still, you do want to be sure your family is presented with a mid-day meal that is nutritious, well-balanced, and pleasing to both the eye and palate. And that’s why I’ve written this book: To show you how to do it. I shall give my sister Daisy an autographed copy of my Cookery Book for Christmas. Daisy hasn’t a clue when it comes to preparing a simple lunch for the family properly, the way I do. I don’t think she’s ever put anything more ambitious than a plate of spaghetti and chips in front of Onslow in her life. I’ve never been troubled with hormones myself, thank goodness. I expect that’s why I’m such a superlative cook. But anyway, when they were growing up, my sisters never really had to cook. They had me. And now, thanks to my becoming a world-famous Cookery Book author, you have me too. You will love this Simple Lunch for a Family. It’s one of Richard’s favourite menus for Lunch. Whether he is out in the front garden deadheading my roses or merely sitting on our three-piece suite (an “exact” replica of one at Sandringham House!) attempting to finish The Times crossword, when the tantalizing aroma of this Lunch begins wafting towards him from my kitchen, Richard comes running! (A tiny word of caution to the ladies, if I may: This particular Lunch has been known to have a very powerful effect on husbands, romantically. I don’t have that problem with mine anymore, of course: He’s early retired, thank heavens. But all the same, it’s better if you don’t serve this Lunch on the day you’re assigned to work at the Charity Shop with Mrs Councillor Nugent. She’s dedicated herself to the suppression of romantic behaviour and she’d know in a flash if there were any about the place. First, you must make a little trip to your local quality butcher. There you will buy two equal size flank steaks, the size you think you and your hubby will be able to eat in one sitting. Draw a life-size picture for your butcher – he provides “butcher paper” for this purpose. From your drawing, your butcher will be able to cut you two flank steaks just the size you want. No need to buy a cut of meat that’s too expensive for this Lunch – you’re not cooking to impress. Next, stop in to your local greengrocer and buy just the right amount of greens for you and hubby; don’t be too elaborate with this. Ordinary greens will do. You don’t want mixing too many colours of green in your salad. Two or three colours of green are quite sufficient for a salad. More than that makes Sheridan dizzy. He once fell out of his chair in a faint at one of my Candlelight Suppers (See Chapter Six: “The Candlelight Supper”) when I added a fourth colour of green in with the salad. So please keep this in mind when you’re choosing your greens for your salad. But once you’ve got your two or three colours of green well in hand, you can move along to the fruit display and here is where you can let your imagination run riot! Be fanciful! Enjoy yourself! Buy something “really” exotic – like kiwi fruit. Get out your broiler and your wooden cutting board. Place the two flank steaks on your cutting board, take your mallet in hand, and commence pounding. This will tenderise the steaks and nobody’ll ever know they weren’t expensive. By the way, I made this very Lunch for my Richard on our wedding anniversary – the day he announced he was having me alarmed! Of course, had he cooked more for our breakfast than that stack of burnt toast, I wouldn’t have had to cook lunch. Well no matter. What’s done is done. Combine in the top of a double-boiler: ½ cup red wine, 2 Tablespoons tarragon vinegar, 1 Tablespoon finely chopped shallots, 2 crushed peppercorns, 2 sprigs chopped tarragon, 1 sprig finely chopped chervil, and 1 sprig of parsley. Cook this mixture over direct heat until reduced by half. Remove it from the heat. Once the mixture is cooled, beat it briskly, adding a little at a time the following: 3 egg yolks and ¾ cup melted butter. No need to apply your solid silver sauce separator to your Sauce Bernaise. This isn’t a Candlelight Supper (See Chapter Six: “The Candlelight Supper”.) Just put it in a gravy boat. If you don’t know how to make a green salad by now, you haven’t been paying attention. But besides the instruction I gave you for limiting your colours of green to three, you must be sure – particularly if you’re fortunate enough to have a brilliantly gifted son who has an artistic temperament like my Sheridan – that the leaves of your greens are of equal size and arranged symmetrically in the bowl. My husband Richard is oblivious when it comes to equality and harmony in the presentation of food, but when Sheridan lived at home I always paid careful attention to the arrangement of the salad! Asymmetry of any sort makes his feet go rigid. Of all the puddings I have ever made, Fruit Fool is Sheridan’s favourite. Richard and I enjoy it too. Here’s how you make it: Whatever fruit you bought at your greengrocer’s, it’s best to serve it fresh for full vitamin impact. It also takes less time to prepare and time, for the busy hostess, as I’m sure I needn’t remind you, is always of the essence. Raspberries and strawberries make an excellent Fruit Fool. Wash them, remove their stems, put them in a bowl, and add powdered sugar to taste. Good cooks always cook “to taste”. If you have not yet acquired any and your cooking suffers as a result, keep practicing and soon you’ll be as tasteful as Hyacinth is! (This is a little joke I thought up as I was writing this part – but how true it is!) Let the sugared berries stand for 10 minutes. An even simpler lunch for a husband left ‘on his own’ – temporarily! Elizabeth once revealed to me that whenever she is going to be away from home at lunch time, she always makes sure she has prepared something in advance for her brother Emmet. She told me this whilst I was mopping up during one of our morning coffees. I do wish Elizabeth would take my advice and put herself on a yoghurt regimen. It’d calm her nerves and save me a lot of work! But be that as it may, it seems that Elizabeth’s hairdresser had changed her regular appointment that day and so she was having her hair done during lunch. It’s hard to believe Elizabeth visits the hairdresser regularly as her hair never looks like much. But anyway, I had offered, purely as a neighbourly gesture, to have Emmet over for lunch whilst Elizabeth was having her hair done. That’s when she told me she always prepares his lunch in advance. And that’s when, for some unknown reason, she spilled her coffee all over my table. Oh well, as I told her, I never worry about my things. I’m sure it’s not beyond the bounds of modern technology to resurface my table. Apparently, Elizabeth was accustomed to preparing her hubby’s lunch in advance, too, when he was still working here instead of off in that awful Third World country, wherever it is. I just hope he doesn’t come back riddled with tropical ailments. I told Richard, I said, ‘We’ll have to be very careful which glass he drinks from at my Candlelight Suppers.’ (See Chapter Six: “The Candlelight Supper”.) I don’t think Elizabeth is a very accomplished cook. Otherwise, her husband would still be at home. When I must be away from home during lunch time, I am not in the habit of preparing anything for Richard ‘in advance’. I have too much on my plate as it is. And Richard understands perfectly the busy life of a lady heavily involved in the welfare of the community. He wouldn’t dream of requiring me to prepare lunch at The Bucket Residence if I weren’t going to be there to enjoy it with him. Of course I am rarely, if ever, away from Richard at lunch time, now that he’s early retired. Richard says it feels like I’ve never – ever -- been away from him at lunch time or any other time. He is such a dear husband. 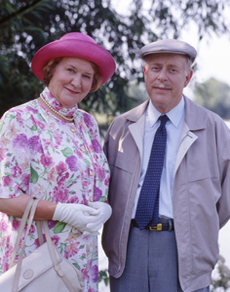 Even in his midlife crisis (a time when men frequently are attracted to other women) Richard reassured me, ‘Hyacinth,’ he said one day as we were driving to look at country property, ‘I assure you: One woman is enough for me.’ Beautiful sentiment. We’re very close, my husband and I. I can’t think of a couple I admire more. I really can recall only one time when I was going to be away at lunch time. That was the time I was called upon to organise the Ladies’ Luncheon Committee at the Manor House Function Rooms in Morton Road. We were having a Commodore speak to us and so of course it fell to me to take charge of everything. It always does. Richard and I once spent a weekend aboard a yacht and so I expect that’s why the ladies felt I was especially qualified to take the Commodore in hand. It rather turned out the other way round in the end. But there’s no need to go into all that here. This is a Cookery Book and not a Dame Barbara Cartland novel. Anyway, the day the Commodore was due to arrive, I told Richard, I said, ‘You’ll be on your own today, dear. You’ll have to fend for yourself at lunch.’ Richard was a bit despondent – he does miss me so when I’m away. But it couldn’t be helped – I thought. As it turned out, there was a series of unfortunate mishaps to do with the Commodore that day, beginning when the train bringing the celebrated old sea dog didn’t arrive at the right station, which was fortunate as they had no red carpet service there anyway. But that’s all water under the bridge, as the saying goes. When Richard worked for the Town Council (Deputy Head, Department of Finance and General Purposes) he always ate his lunch “out”. He was a well-known figure about town in those days; at only the best places, of course. That goes without saying. And now, if an occasion should arise where I anticipate being away from home at lunch time, I expect Richard to follow suit. He shall take me to wherever it is I’m going, and then he shall return to whatever it was he was doing before we left – usually pottering in the garden or polishing our car (I don’t like Richard doing anything important indoors without myself there to supervise). When it’s time for lunch he can go “out” some place and eat it. Nothing could be simpler than that. Except I’ve been thinking lately about the quality of restaurant available to a man like Richard, one who is married to the acknowledged Queen of the West Midlands social circuit scene. I believe I should like Richard to join the Rotary Club. It’s the club in town for gentlemen. Then he could eat his lunch there if ever I’m away. I put the idea to Richard just now whilst we were discussing what should go into this portion of my Cookery Book. He says he doesn’t mind the sacrifice and would gladly join the Rotary Club this minute and eat lunch there on his own every day if that would make me happy. I don’t think we need go that far. But I do want Richard in the Rotary Club. He can go and get them started on processing his membership this afternoon after we’ve had tea and whilst I’m busy planning his Rotary Club Initiation Banquet. I’m too distressed at the moment, recalling that awful birthday party fiasco of Onslow’s to instruct you how to do an elegant pre-luncheon cocktails and canapes at home when the actual luncheon is going to take place “out”. We’ll get to that after I’ve recovered myself. Richard is so concerned about me, he’s gone off to the kitchen to make me a cup of tea. (See Chapter 5: “Tea”.) But no need to worry about me. I’ll be all right. In fact, whilst we’re waiting for my hubby to boil the kettle, I shall move you right along to learning the art of organising the really elegant affair – “an elaborate ladies’ luncheon with Guest Speaker”. Having a Guest Speaker for an elaborate ladies’ luncheon is paramount. It doesn’t matter what the Guest Speaker actually speaks about just as long as you’ve got one. Of course the topic must be something tasteful. That goes without saying. And it helps if it’s educational. But having a Guest Speaker for an occasion like this is all important! It means the difference between you (as chief organiser) sitting at the head table to no purpose and with ordinary china and you sitting at the head table next to the Guest Speaker and with your very own genuine antique heirloom china. I hope you have some because you don’t want yourself and other prominent members of your ladies’ circle using china that’s been mixed in with all the rest. I, myself, as eldest daughter, am fortunate to have inherited a set of elegant china with hand-painted periwinkles on. And I always box them up and have my Richard bring them with us when we set the table for an elaborate ladies’ luncheon. Without my hand-painted periwinkles, social affairs of this calibre would be rather ordinary. But a tiny word of caution here, if I may: Do not allow anyone but yourself to handle your delicate, hand-painted china, especially if you’re accompanied by a clumsy neighbour like mine. Elizabeth is a receptive person, one who is willing to watch and learn; but she has so little confidence, socially, that whenever she’s in the presence of my fine china, she always goes to pieces! Which is, unfortunately, what also happens to my china whenever Elizabeth gets hold of it. Still, clumsy helpers or not, it is imperative that you pay particular attention to the quality of your accoutrements when organising an elaborate ladies’ luncheon with Guest Speaker. Because you won’t have much control over what goes on the accoutrements, I’m afraid. I’m talking about the food of course. The one drawback to having a Guest Speaker at an elaborate ladies’ luncheon is that everybody will be trying to impress him. All the ladies will suddenly decide they are “cooks” and each will want to get in on the act and bring her own special “dish”. This can wreak havoc on a well-organised elaborate ladies’ luncheon with Guest Speaker, but it can’t be helped, particularly if the affair happens to take place in a religious setting like an Anglican church hall, where the whole thing will be casually ecumenical from the start. It’s better if your elaborate ladies’ luncheon with Guest Speaker is planned for a place like the Manor House Function Rooms on Morton Road. There you can allow yourself a certain degree of latitude as I planned to do when I decided to bring the Commodore home for a glass of sherry before luncheon with the other ladies. Richard was going to stand outside the door of our lounge, listen for the clink of some very high quality glassware as our golden galleons met and then he was going to commence singing, “Hearts of oak are our ships”. I had him all rehearsed for the occasion. And I’d gone over it with Emmet and Elizabeth that very morning at coffee (See Chapter Three: “Coffee”). Of course, as I’ve already explained, the Commodore came in on the wrong train so we didn’t quite manage to get him to The Bucket Residence for sherry. It was for the best though. Riding with the Commodore to the station was quite enough excitement for one day, if you ask me. Richard says the Commodore had obviously been away at sea too long. Anyway, enough of my problems. Let’s move along to discussing the food for your elaborate ladies’ luncheon with Guest Speaker. Ooops! Here’s my hubby with my Earl Grey. Why don’t you take some time and browse through Chapter Five (TEA) whilst we have ours. And then I’ll meet you back here at 3.25. There. Now wasn’t that a nice break? I trust you’ve come back to me refreshed and ready to talk about food. And that during your browse through Chapter Five: “Tea” you learnt something you didn’t know before. As noted above, the food at an elaborate ladies’ luncheon with Guest Speaker where the venue is casually ecumenical and where there are several ladies involved whose cooking skills are marginal at best, can cause what should be a perfectly organised social occasion to deteriorate into one of those chaotic affairs – if you’re not careful! But I shall tell you how I manage to cope with the unstylish “dishes” the other ladies bring and then you can copy me. I prepare myself ahead of time by saying a little prayer. Even though an elaborate ladies’ luncheon with Guest Speaker is an elegant social occasion, still, that makes it no less religious, especially if it takes place in an Anglican Church hall. So, do like I do when organising an elaborate ladies’ luncheon with Guest Speaker: Use it as an opportunity to express your natural Christian charity. A little prayer before hand will help you steel yourself in the face of adversity. Because you will need to exercise the utmost tact when supervising the ladies, particularly when you first clap eyes on the too often lower middle-class quality of their various contributions. In your heart of hearts, you will be well aware how the event could benefit from your own stylish haute cuisine cookery, but you must never let on! Be gracious like I am: Resist the urge to comment unfavourably upon the other ladies’ cooking. As Richard frequently reminds me with a sigh, ‘If all the women in the world were like you, Hyacinth, what a world it would be.’ Dear Richard. I’m afraid I’ve spoilt him too much! But of course if I were in complete control of the menu for an elaborate ladies’ luncheon with Guest Speaker (as I shall be once I’ve had that talk with our Vicar he’s been promising me for yonks) it would be a high-calibre menu you would be proud to duplicate for your own elaborate ladies’ luncheon with Guest Speaker. As it is, I’m afraid you’ll have to do the best you can with this rather unimaginative variety of food. At our last elaborate ladies’ luncheon with Guest Speaker, there were only three items brought to the table that were even recognisable! Except for that dish all reeking of garlic and I don’t think garlic is quite appropriate for an Anglican church hall. It’s the easiest thing in the world to produce sausage rolls, which is, I expect, why the ladies are so fond of bringing them to these affairs. None of them put any effort into their cooking the way I do. Here’s a recipe for sausage rolls as I would make them, if I chose to do so. They are, as I have pointed out, decidedly lower middle-class fare and not what I myself would choose for an elaborate ladies’ luncheon with Guest Speaker, but here they are. You may do as you like with them. Upon the odd occasion, I have been known to serve sausage rolls for tea when my family takes a notion to pop in unannounced, but I wouldn’t dream of giving them to a Guest Speaker. Roll out the puff pastry (buy it ready made when it’s “marked down” and keep it in the refrigerator for emergencies) to a ½ inch thickness and cut into 5-inch squares. Beat the egg and milk together. Brush around the edges of the pastry with the egg mixture. Make a “roll” of sausage meat (your hubby can run out to the corner shop for this at the last minute if need be; no need to bother your quality butcher) just short of the pastry length using about 2 ounces of sausage meat and place to one edge of the pastry. Roll up the pastry and place on a baking sheet with the pastry edge down. Brush the top of the rolls with the egg mixture and cut two slits about ½ inch long diagonally on the top. Bake in a fast oven for about twelve to fifteen minutes. There you have it then: Sausage rolls. But of course the day of our elaborate ladies’ luncheon with Guest Speaker at the church hall, I couldn’t simply let the subject drop there, could I? No, as modest as I am, I couldn’t disappoint the ladies. Yes, people are always wanting to know about my son – a brilliant boy, Sheridan! ‘My Mummy,’ he used to say, ‘designs the perfect salad.’ Of course I was covered in embarrassment. But that’s how he is. Dear Sheridan. He’s quite an advanced cook in his own right. Sheridan’s little fairy cakes (See Chapter Five: Tea) are a sight to behold, I don’t mind saying. Richard agrees. He’s such a proud father. Yes, Richard is still here, seated right by my side, shaking his head in awe and admiration at the mere mention of Sheridan’s fairy cakes. Richard, why don’t you remove the tea things now, dear. We’re done with the tea. Come along, Richard. Don’t dilly dally, dear. The tea things are in the way here – I need room for discussing Sheridan! My Readers would never forgive me if I didn’t talk about Sheridan to them. Whew. Richard is a well-meaning husband but he has so little initiative. Fortunately, Sheridan has inherited all the initiative he needs from his Mummy. Yes, our son is such a dear boy – his Scoutmaster said he’d never seen anyone apply more grit and determination to the acquisition of his cook’s badge than my Sheridan. I shall give you the recipe here, as I myself make it, for Mrs Watson’s cake. It’s Sheridan’s favourite cake -- when it’s made properly. Preheat your oven to 325 F. Have all the ingredients at 75 F. Sift 4 cups of cake flour. Resift them with 1 teaspoon salt and 4 teaspoons double-acting baking power and ½ teaspoon mace. (Be sure not to forget the double-acting baking powder or your cake will look all flat and lopsided like Mrs Watson’s. Poor dear. She does try; bless her.) Mix together till creamy 1 ½ cups of butter and 3 cups of sugar. Add 8 eggs, one at a time. To the creamy mixture, add the flour mixture alternately with 1 cup of milk, and 2 teaspoons of vanilla. For festive occasions, you may add 2 Tablespoons of brandy; when I’m making this cake for Sheridan, I like adding 8 drops of rose water rather than the brandy as I don’t think brandy is quite nice for growing boys; of course rose water might remind him that he has an aunt who wears mini-skirts, but Richard says Sheridan won’t be appalled if I don’t tell him I’ve added it. Pour the batter into two greased 9-inch round cake pans and bake for 15 to 20 minutes. When the layers are cool put a chopped fruit filling between them. My Sheridan always develops such a rosy glow when presented with fruit filled things. Cook in a double boiler over hot water: ¾ cup evaporated milk, ¼ cup water, ¾ cup sugar, and 1/8 teaspoon salt. As soon as the sugar is dissolved, add and cook until thick: ¼ cup each chopped dates and figs. Cool these ingredients and add 1 teaspoon vanilla and ½ cup chopped nut-meats. Walnuts are good. Then you can frost the tops and sides with a nice fluffy white frosting. Place these ingredients over rapidly boiling water. Beat them constantly with a wire whisk or a rotary beater for 7 minutes depending on which accoutrement you have and your energy level at the moment. You don’t want to flag before the meal even begins! After the 7 minutes are up, remove the frosting from the heat. Add 1 teaspoon vanilla. Continue beating until the frosting is the right consistency to be spread. It should be all nice and fluffy and white. If it isn’t, then you haven’t been following directions. Richard, make a note for me, dear: Send Mrs Watson one autographed copy of Hyacinth Bucket’s Better-Class British Cookery Book (for the Socially Unfortunate). There. I’ve helped you with three of the items for your elaborate ladies’ luncheon with Guest Speaker – the only three that are at all worth salvaging. Try not to think about the rest. Just bring your own delicate heirloom china, position yourself correctly at the top table next to the Guest Speaker. And smile! Now we’ve taken care of all possible luncheons you might be faced with, socially, let’s backtrack just a tiny bit and make sure you know what to do if you’ve been invited to lunch “out” with Somebody Important. This won’t be a Guest Speaker, but it may well be a Greek shipping millionaire! Of course, he’ll probably be talking your arm off at lunch – you know how they are. They love chatting about their oil tankers and off-shore funds. You’ll probably be in for a boring time of it. But all the same, you’ll want to invite a group of select friends in for pre-luncheon cocktails in order to give the right impression when your wealthy Greek friend picks you up in his limousine. As a thoughtful hostess, you’ll want him to see that you have a solid social position in order to reassure him that he’s amongst his own kind. Strain this mixture into chilled glasses. That’s all there is to it! This is a recipe Elizabeth found for me in one of my haute cuisine cookery books. I put her to researching my collection of cookbooks whilst I made a list of who to invite. (Or should that be “whom”?) Richard was supposed to bring home things for mixing and he practically brought home the store – all that grenadine, lemon juice, and brandy! We happened to have a small bottle of gin (the Queen Mother’s favourite libation) in the cupboard already, left over from celebrating the Millennium. Fortunately, Elizabeth found the perfect recipe for mixing it all together. Once Richard ran out to the market for some more eggs. Of course you’ll want more than cocktails at your pre-luncheon cocktail party. When I put Elizabeth to researching my collection of haute cuisine cookery books I said, “You know the sort of things I mean, Elizabeth – tasty little morsels, things on sticks.” (No pre-luncheon cocktail party is complete without things on sticks as was soon corroborated by the Major when I phoned him. Those were practically the first words out of his mouth: “I expect you’ll be having little things on sticks!”) I am proud to say I was able to assure him I would indeed be having little things on sticks. I debated long and hard whether to invite the Major or not. He isn’t always as reliable as one would wish. But in the end, I decided I should be all right for an hour in a crowded room. Elizabeth’s never had any trouble with the Major. But then I don’t expect she would. She’s lucky. It’s such a burden sometimes, being attractive to men. You already know how to mix up the Pink Ladies – that is, the Pink Lady Cocktails. I never know if those things are singular or plural. To be on the safe side, mix them last, just at the moment your guests arrive. Because in mixing to “taste” (See my instructions for making Fruit Fool on page 39 of this chapter: “cooking to taste”; the same rule applies) you may be tempted to overdo it. It’s no good losing your train of thought when you’ve got little things on sticks on one hand and the Major on the other! It’s happened to me more times than I like to think about. So watch out. Here is my recipe for Flower Canapes, which are really lovely and can be made to represent all sorts of different flowers. They’re so appropriate for a family with four sisters named Rose, Violet, Daisy and, of course – Hyacinth. your flower. At the top of the “stem” place a slice of stuffed olive or a carrot or radish you’ve cut into a stylish floral shape (keep it in miniature please, although if you want to form a Hyacinth it may be a bit more prominent than the rest). To form leaves at the sides of your “stem” you may use small sweet pickle slices, cut and placed to look like leaves. There you are: Flower Canapes. Your guests will marvel at these!! Really, you can put anything you like on little cocktail sticks. Just use your imagination, like Elizabeth did. And your leftovers. Buy only select Norwegian prawns, like I do. Serve them on a bed of lettuce over crushed ice and provide cocktail picks for your guests to skewer them with. After you’ve mixed all this together, bring it to a boil; reduce the heat to simmer and cook 15 to 20 minutes or until the mixture is slightly thickened. Your guests can dip their prawns in this if they like. It’s quite good – surprisingly. And now for the Piece de Resistance – your guests will be positively bowled over by this one! (Warning:*** Limit your guests to 3 prune surprise one-bite canapes each – and that’s all! You should use the largest prunes you can find for this recipe, but – I repeat – don’t allow your guests to have any more than THREE of these or they’re apt to be rather more surprised than you want them to be at what would otherwise be a very elegant party. This Warning*** goes double if you’ve got a Daddy in attendance.) One doesn’t like one’s stylish affairs turning into a fiasco, no matter how tasty and tempting the food. Now: With a small pointed knife, cut the prunes lengthwise and remove the pits. Mix equal parts butter and Roquefort cheese. (If your guests are not the adventuresome sort, choose either Shropshire or Stilton cheese instead as either one will give a distinctly more comforting British flavour to the whole proceedings.) Stuff each prune with this cheese/butter mixture and wedge a small roasted chestnut securely into the centre. Wrap around each cheese and nut-stuffed prune a prune-sized strip of streaky bacon that has been grilled but not so much that it is no longer capable of being wrapped around something. Cover each bacon wrapped cheese and nut-stuffed prune with a very flaky puff pastry. (I’m leaving you on your own with this: buy it at your local Tesco’s; nobody’ll know the difference). Place your pastry covered, bacon wrapped, cheese and nut-stuffed prunes in a hot oven for 10 minutes or until they are golden brown. The presentation of Hyacinth Bucket’s Famous Flaky Prune Surprise (!) one-bite canapes is all-important. I like putting mine on an exquisite cut-glass dish atop a bed of watercress. Watercress used to be easy to find round here. It once grew rampant on the grass verges near the canal. But with all the new building going on (we live in a very popular area, arguably the most superior postal code in the West Midlands) watercress has become a rare commodity. It’s very difficult to find any growing wild now and frequently Richard is gone for half a day, foraging for my watercress. But it’s worth it. Because you want to make your guests feel really special – you want them to feel welcome in your home – you want them to feel that they “belong”, and that you really care about them; in short, you want them to feel that they are “family”. Speaking of which, after you’ve enjoyed your pre-luncheon cocktails and canapes, and even with limiting yourself to only three of Hyacinth Bucket’s Famous Flaky Prune Surprise (!) one-bite canapes, it’s doubtful whether you’ll have any appetite left for celebrating (I use that term loosely under the circumstances) your socially unfortunate brother-in-law’s birthday lunch at some awful place frequented by the spaghetti and chips brigade. Which is, of course, one of the little “fringe benefits” of having a cocktail and canapes hour prior to such an event. You can skip it altogether in the case of an emergency*** and you won’t go hungry. ***Warning: There are times when indulging oneself in more than three Flaky Prune Surprise (!) one-bite canapes may come in handy and this is one of them. If you’ve no unfortunate relatives on your family tree, you’re lucky. I wouldn’t have any on mine either if my sister Daisy hadn’t married Onslow. 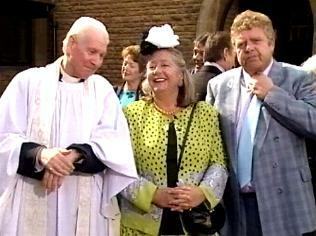 She was a well brought up girl and I don’t know why she had to marry Onslow. We warned her what would happen: It’s no good undershirts interbreeding with suits. 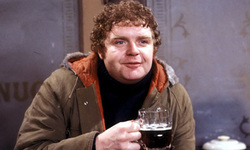 But Daisy thinks Onslow’s attractive! She thinks he looks like Marlon Brandon in ‘A Streetcar Named Desire’. Poor demented Daisy. She’s too romantic. But what’s done is done and he’d hardly managed to carry her across the threshold when up pops their daughter Stephanie! Well at least they were married when Stephanie was born. I can’t say the same for Stephanie. She had her little girl Kylie christened not too long ago and we still don’t know, of the two scruffy looking hippies who accompanied her, which one’s the father. I was just thankful Sheridan wasn’t there. He would’ve been appalled. What sort of a name is Kylie anyway? It sounds like a foreign vegetable. Be that as it may, we were all taken out for lunch after the christening – to a Public House. This is one of the lunches “out” you want to beware of. As a charitable gesture to your family, you may go to a lunch “out” like this. But you needn’t enjoy it. Another lunch “out” of this sort is the lunch Daisy invites us to every year on Onslow’s Birthday. It’s the bunfight at the OK Corral! Why, we’re knee-deep in chips and sauce bottles in the first five minutes. But try as I may, I cannot seem to get Richard to come up with an inspired alternative. It’s very hard at a time like this to be married to a man with no imagination. I shall never forget the day we were led to believe that Rose’s gentleman friend, Mr Marinopolous, was a Greek shipping merchant. I organised a pre-luncheon cocktail hour at The Bucket Residence for a group of our select friends so this oil tycoon would know he was amongst his own kind. That was a lovely party. I’ll tell you how to duplicate one for yourself in a minute. But meanwhile, don’t bother buying expensive cufflinks for a brother-in-law who never wears a shirt!